I was recently contacted by Michael Luttig of Badger’s Tea Room in Alfriston, East Sussex in the UK. 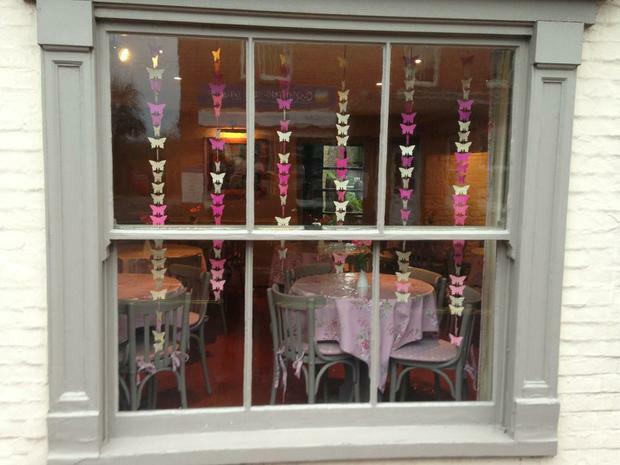 He commissioned me to make some Butterfly mobiles and garlands as a spring window display for his lovely little shop. Here is a pic of one of the windows. The tea house is situated in Alriston’s old Village Bakery, which dates back to 1510. They even have a Standing Stone in the pavement outside the front door! Their cakes and scones are baked daily by Michael and Lynn, using organic free-range eggs and premium ingredients. Thanks, Michael, for the lovely pic!